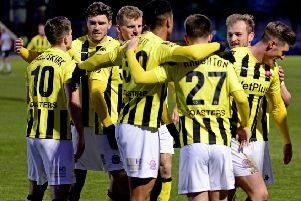 Defeats for Ebbsfleet and Sutton meant the fifth-placed Coasters retained their nine-point cushion in the National League play-off zone with just three matches remaining. That didn't ease manager Dave Challinor's frustration after this defeat to a relegated side who started the game bottom of the table. Fylde were unchanged from Tuesday's win over Gateshead but it was the hosts who came flying out of the traps at Cressing Road, their direct style posing problems for Fylde from the start. Their fate already sealed , the Iron played with freedom and Korey Henry was the focal point of their attack. It was the Coasters who had the first chance, Nick Haughton's knockdown teeing up Danny Rowe, who connected well but his shot was held by Ben Killip. The driving rain turned into hail but that did not affect the exquisite touch of Haughton. He again found Rowe, who turned Andrew Eleftheriou inside out before his low effort was again well held by Killip. Rowe was also combining well with Alex Reid, setting up his fellow frontman to round the keeper and slide home but the offside flag denied Fylde the opener. Instead it was Braintree who netted the first goal when Mo Sagaf fired home a 25-yard free-kick after 31 minutes. His curling shot was beyond the reach of keeper Jay Lynch and nestled in the bottom right corner. The Coasters almost responded immediately as Rowe tried a curling free-kick of his own from even further out. The ball rose and dipped as if by command only for the fingertips of Killip to deny the league's top scorer. Killip looked less assured as he fumbled Haughton's long-range effort but the ball went behind and the Iron held their lead until half-time. Braintree continued to look lively after the restart, the dangerous Henry forcing the Fylde defence into some awkward clearances. This prompted Challinor's first change as James Hardy replaced Reid but the hosts almost doubled their lead when Robert Atkinson's looping header rebounded off the crossbar and Henry's follow-up effort bounced over the top. Dan Bradley saw lots of the ball for Fylde and one run saw the defence open up in front of the midfielder, though his decision to pass to the overlapping Arlen Birch proved the wrong one and the opportunity was missed. Birch was replaced by Serhat Tasdemir and a key moment soon followed as Haughton went down in the box under the referee's nose. However, the forward was booked for simulation. To add to Fylde's frustration, the hosts were awarded a penalty immediately afterwards as Jordan Tunnicliffe was adjudged to have brought down Henry. It seemed a soft decision but the assistant raised his flag to indicate a foul and the referee was of the same opinion. Henry's tame spot-kick was parried by Lynch but Courtney Richards anticipated this brilliantly and slammed home the rebound on 79 minutes. Lewis Walters replaced Danny Philliskirk to add another attacking threat for Fylde, who finally made a breakthrough on 85 minutes. Rowe’s fantastic cross from the left was volleyed home from close range by Tunnicliffe but it was too little, too late. A Rowe free-kick gave Fylde an injury-time chance to restore parity, and although Killip again fumbled he grasped hold of the ball and the points. The win lifted Braintree off the bottom and Fylde were replaced in fourth by Wrexham. It now looks very difficult for the Coasters to climb into the top three, who all won. Challinor said: "It's disappointing. It makes me angry and it's an opportunity missed, but it's important we move on. Braintree: Killip, Eleftheriou, Lyons-Foster, Atkinson, Borg, Richards, Karic, Eyoma (Allen 74), Sogaf, Matsuzaka, Henry; subs not used: Eze, Gipson, Cerulli, Smith.